Despite Improvement In Macro Indicators And Growth, Industry Leaders Cautious, Wait For Stronger Revival Signals. The demand for new homes in smaller towns and cities and lower interest rates seem to be driving up housing loan growth, which has gone up by around 19% till September. Unlike the past when bigger lenders like SBI were top performers among the public sector players, the action has now shifted to smaller lenders such as Syndicate Bank, Andhra Bank, Central Bank of India and UCO Bank, some of which are registering growth rates higher than private players such as ICICI Bank and HDFC. 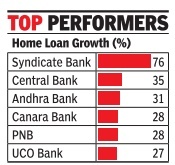 Syndicate Bank, for instance, has seen its home loan port folio expand 76%, while Central Bank and Andhra Bank have seen a rise of over 30%, indicating that housing activity in smaller cities is picking up. ICICI Bank's home loan book has expanded by around 28%, while HDFC has seen a 23% growth In contrast, the growth at SBI was just around 15% during the year to September 2015. For the public sector banks as a whole, outstanding home loan grew by 18.7% to Rs 4.78 lakh crore at the end of September, compared to a 14.9% growth witnessed till the end of September 2014, data compiled by the finance ministry showed. But the worry for the government is the low demand for financing of affordable housing. Although the finance ministry had set a target of 30% for the current financial year, the growth up to September was a mere 4.7%, half the rate witnessed a year ago.This was mainly due to low off-take in the sub-Rs 5 lakh segment.The maximum rise was seen in the over Rs 25 lakh segment, which registered a 36% growth.